Under-the-counter, four-stage reverse osmosis system. 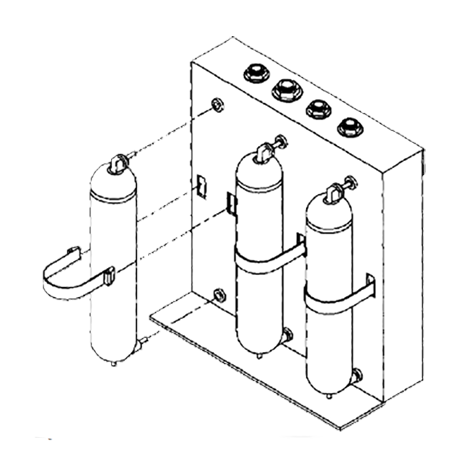 Integrated purification assembly includes pre- and post-filters and RO membrane. Produces up to 30* gallons per day. High capacity encapsulated sediment/carbon pre-filter and high capacity activated carbon post-filter. High flux thin film composite RO membrane with extended chlorine tolerance (up to 1.0 ppm). Color-coded filters and matching quick connect tubing combine to make filter changes simple and sanitary. Installation Kit includes air-gap faucet, space-saving two gallon white storage tank, tubing and quick connect fittings for a simple feedwater connection. Recommended for residential use, municipal or private water supplies. Central drinking water system available without tank and faucet for cooler applications. *Osmonics or Dow Filmtec encapsulated thin-film membranes for increased product water. Faucets available in a variety of finishes. UV and Low Pressure models also available. Faucet-mounted water quality monitor ensures high-quality drinking water by monitoring the product water TDS level. Please refer to the Owner’s Manual for NSF certification information. The Nimbus Sierra offers leading edge reverse osmosis technology and performance within a compact, economical unit. The Sierra’s three stage process utilizes a reverse osmosis membrane with pre- and post-filters to remove up to 98% of the dissolved solids normally found in water. It removes that “less than perfect” taste providing flavor that’s as fresh as spring water — glass after glass. The color-coded filters and matching quick connect tubing make filter changes simple and sanitary. Of course, our cartridges are 100% factory tested before they are sealed and shipped to you dry. An optional water quality monitor fits neatly under the faucet to remind you when it’s time to replace filters. Complete; includes RO system, compact 2 gal. storage tank, faucet, tubing and quick- connect fittings. TF-30 GPD standard membrane. Up to 75 GPD with optional membranes. Compact 2 gal. storage tank. Optional faucet-mounted water quality meter. Integrated design offers easy, clean installation. Color-coded fittings make installation and service simple. Plenty of great water for plants, pets, cooking. Higher flows increase output for families, offices. Stainless steel construc- tion is durable and guaranteed lead-free. Membrane replacement monitor ensures consis tent supply of great- tasting water. Encapsulated 25 micron prefilter removes dirt, rust, sediment and chlorine. This increases the clarity of each and every drop you drink, while prolonging the life of the membrane. The high performance reverse osmosis membrane reduces metals and salts such as lead and sodium and fluoride. Carbon filters alone can’t accomplish this. The water passes through an encapsulated, granular-activated carbon post-filter to remove unpleas- ant flavors and odors caused by chlorine and organic materials.